Do you feel like you’re working so hard at living, but don’t really have a life? Do you want to find a way to make an income without sacrificing family time? Could you use an extra $300-500+ a month? I know exactly what that’s like. In 5 short months of being business I have been simply sharing my love and my genuine passion for Young Living Essential Oils that I have already ranked to executive. 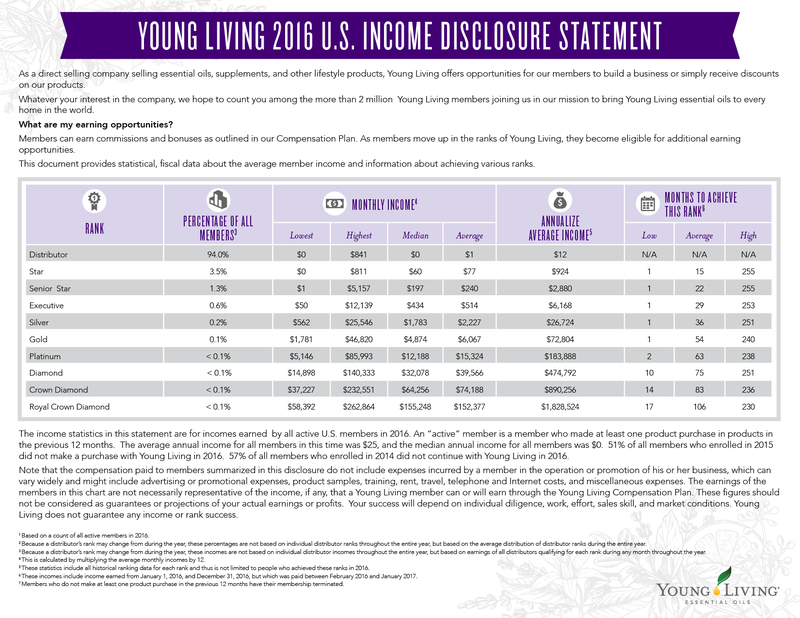 Young living doesn’t keep secrets, check out the income discloser here! An average person makes $549 a month as an executive it also says that it takes the average person 23 months to get to that rank! Guys! I have done it in 5 short months by simply sharing my passion with my friends. I know this isn’t an income that can support my family (yet) but it is an amount that truly makes a difference and helps with the little things. I love being able to makes some extra cash while still being able to stay home and teach and snuggle with my 2 handsome boys. What if I told you there was a way you could start a home-based business with your family without a huge investment and crazy hours? What if I told you there was a way to make a great income and work on YOUR schedule? Thats exactly What Essential Oils can do! I was introduced to essential oils through a friend, and I absolutely fell in love with them. I used them to make my own household cleaners, DIY beauty products, and so much more (check out my tutorials and recipes on how to use essential oils here). I found that I saved so much money by making my own products AND cut out toxic chemicals lurking in my home. Win-win! And since I loved them so much, I started sharing them with my friends and family. Then it happened. I got my first thank you check from Young Living. It felt so natural to share my love for essential oils with others, and I was getting paid to do it. That’s when I started looking into the business opportunity with Young Living. Now I have a great part-time income with my Young Living business after just 5 months with the company. I have team members who are working this business part-time to earn $300-$1500 a month, and others replacing their full-time income and about to bring their husband home to work with them. Why Start a Young Living Business? How does that sound? Amazing, right? Sign up with a wholesale membership to become an independent distributor. The great thing about becoming an independent distributor is that it’s a low investment to start up. It’s just $160 for a starter kit, which includes 11 oils, a diffuser, and other goodies. This kit is worth about $300 – so it’s nearly half off. There’s no additional start-up fees. Plus, you’ll need that kit to share the oils with others. Sign up with me, and I’ll provide you with all the support, training, and education you need to start your own Young Living essential oils business. In fact, you can like my Facebook page to join a community where we learn all about the oils in the Premium Starter Kit right now. Also, email me your interest and I will add you to my business team page where we encourage, train, and help each other in the business! One you get your starter kit, start using the oils. Learn more about each one and take the time to build your own testimonial for each oil in the kit. When you sign up with me, I will gift you reference materials to get you started so you can build up a knowledge-base. I’m here to help and support you too. But do you need to know everything? Absolutely not! No one expects you to be an expert. Even I’m still learning, and I’ve been using the oils for nearly 6 months. But you do want to take every chance to use the oils so you can talk about them with others. And I recommend you take every opportunity to share your testimonials. Be sure to keep it above the wellness line. We don’t need to focus on sickness or disease. We have so much to talk about with wellness, cleaning, beauty, cooking and so much more. I make it a point to use my essential oils in public. I’ll apply my Stress-Away roll-on while waiting in line at the grocery store. I use Thieves hand spray to clean my kids’ hands at birthday parties. I diffuse oils when I have guests over at my house. And I even post pictures of myself using essential oils on Facebook. This is not selling. This is just me using my oils. And believe me, people will start asking about them. So what do you do then? Look for opportunities to share the oils with others. Teach classes in your home (just use your starter kit and talk about how you use the oils) to family and friends. This could be as simple as three friends around a kitchen table, or a packed room of 20 or more. Do what feels natural for you. I personally love posting live Facebook videos to educate. You can even just schedule a 1:1 with a friend who can’t make it to a class. Make it fun. Meet at a coffee shop and bring your starter kit. Start your own Facebook Oils education page for all your own friends and post live videos (101, education, or DIYs). Nervous about teaching classes? Don’t worry! When you join with my team, I’ll show you EVERYTHING you need to start your business and teach others. I provide you with education, training, support and community with other members and leaders to help you every step of the way. And best of all? This training and resources are available to friends and family you sign up too (if you’re a member of my team). Young Living does have some great business building materials in the Virtual Office too. Plus, teaching classes and sharing the oils is all about education. There’s NO SELLING at all. Just teach classes and then help people sign up with their own account through you. That’s how you earn bonuses and commissions from Young Living. You don’t have to actually stock the oils yourself, or set up a payment system to take orders. Just teach and share, then use your sign-up link (I’ll show you how to get yours once you sign up with me) to get others to sign up. Easy right? You can also get creative in how you share the oils with others. Teach community classes at the local library or recreation center. Host a vendor booth at a school bazaar or local craft fair. Offer educational seminars at church. Make DIY gifts for teachers and friends for the holidays. There are so many options available – it’s totally up to you. You’ve got classes or 1:1 meetings scheduled. You have people signing up. So what’s next? You earn money! Young Living’s compensation plan is very generous, and the best part about it is that you have the ability to earn residual income. So how does that work? Here it is in a nutshell: When you sign up a new wholesale member who also gets a Premium Starter Kit, you earn $50. So sign up a friend with a Premium Starter Kit and earn $50. If that friend orders again in month 2 or 3, then you earn 25% commissions on that order. But imagine when you get 3 sign-ups? You’ll earn almost enough to cover your Premium Starter Kit. Enroll more people in a month, and you’re making even more money. After a member is with you for 3 months, you can qualify for unilevel commissions (8% of their total PV for the month) when you spend 100 PV. At this point, you’ll see that those you’ve signed up will start sharing too. And with unilevel commissions, you earn on members on your level 2, 3, and so on. You also earn 24% commissions when you sign up retail members, but you don’t earn residual income. For that reason, I always recommend wholesale membership – which is just an awesome deal any way you look at it and builds you up for financial freedom. Is that it? No Way! There’s so much more, but I’m keeping this simple for you. But do know that you can also advance in rank with the company and qualify for profit sharing, all-expense paid company retreats, generational commissions and so much more! Isn’t it amazing to see what’s possible? What could you do with an extra $255 a month? Or how about an extra $2,221 a month? It can be done. I’ve ranked to executive in 5 months myself. I’m an executive and on my way to Silver. I’ll show you how and will help you get started. And one more perk… when you achieve the rank of Silver within six month after reaching the rank of Executive you’ll get the Aroma Complete set. It’s a worth over $2,000 and you get it free with the Si6 (Silver in 6) program. It’s a huge kit of 100 or so essential oils. Who wants it? Start your own essential oils business with Young Living – the leader in essential oils for over 20 years. There really is a difference with Young Living, and honestly, the oils really sell themselves. You don’t need to sell. Just share, educate, and be consistent. That is all I have done, so far! ​Who’s ready to get started now? I will help you! 1. Order Your Starter Kit Now! 2. Email Me Your Interest!